The weather has been fantastic recently and I went for a walk during my lunch break to take pictures of mosaic by B C Binning. Bertram Charles Binning (Feb 10, 1909 – Mar 16, 1968) was a painter, architect and educator who played an active part in Vancouver. He was also a founder of the Department of Fine Arts at the University of British Columbia. According to this article, he designed his own house in 1941 and built with $5,000 by using economical building materials such as plywood. It’s a very nice mid-century modern house, but at that time the house looked so ahead of time and there were always people came to see the house. 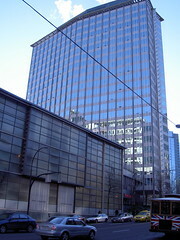 The architects, C E Pratt and R A D Berwick, who constructed the house, designed other buildings with Binning such as the CIBC building and the BC Electric Building. The above is the mosaic artwork done by Binning which is still exhibited in the CIBC building (map) – now it’s a drug store. 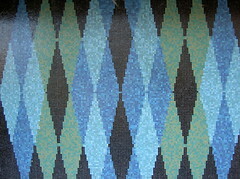 I believe the mosaic expresses the economy of British Columbia. The below is the BC Electric Building (map) and there is a power station next to it, uniquely hidden in the building. 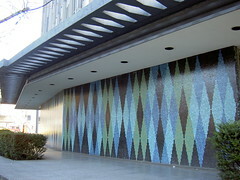 Binning also designed the diamond shape mosaic of this building. I found a real estate agency where you can rent a house designed by Binning – $3000 for one month. It might be nice to stay in such place for a long holiday. Timely speaking, an exhibition of Binning is currently held in the Vancouver Art Gallery until April 29th. I would love to go. My current wallpaper is this photo. Go here to download enlarged size.